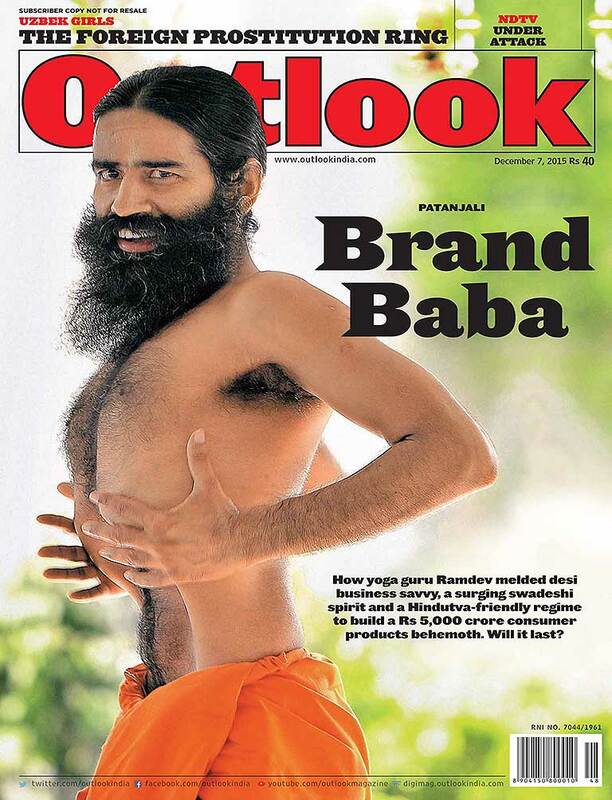 The Baba, who has popularised yoga like no other businessman-sanyasi, talks about being the next FMCG giant, about political vendetta and ‘intolerance’. The Patanjali brand has seen a meteoric rise, and in very little time. Will Baba Ramdev’s ‘pure desi’ wares hold up? Central government employees are plied with perks and pro motions. The Pay Commission promises them a fatter pie. Dr Pushpa Mittra Bhargava on beef, intolerance and other things. The murder of two Uzbek girls exposed trafficking from the CIS states. Outlook talks to others caught in the trap. The five governors appointed by the Narendra Modi government have have disgraced themselves with comments that have often been blatantly bigoted. The West united in grief over Paris. It shrugs off other atrocities. Why don’t all terror victims count? Will the HRD minister’s desire to leave her mark spell doom for the draft new education policy? Khadija Banu is a lone warrior. She brings light to women trapped and abused. Indian food has cracked the code of mixing cereals and pulses in the right proportion to create plant protein combos that are easy to assimilate. Fast bowling and back problems. Rajnigandha pan masala, the patron saint of literary festivals and what happens when two introverts are placed on a dais and asked to launch a book. There are press clubs and there are press clubs, but none quite so unique, it would seem, than the Press Club of Odisha. In a sense, these happen to be love stories involving strange encounters with food. Adele's 25has depth and feeling and the kind of musical instinct about tone and tenor that very few can match. Making its way to five cities this winter the Aadi Anant Music Festival, Dastkar's annual nature bazaar and much more.